This is an Odd Couple akin to Matthau and Lemmon, the elder statesman of esoteric Rock guitaring combined with a smart young Psyche man, producing a bloody good night of music, actually. McKane's three-track EP is a blissed out guitar wig-out with such a variety, I can't wait to hear the album; here he had a sunburst projected backdrop and an assured manner combined with a sweetly modest chat. He and his band really went for it though, big Rock chops, shapes thrown, a very big statement; 'A Rock And Roll Story' was a glorious mess and sweet whimsy, good stage attire too, at least for most of the band, the drummer and keys-man chose to ignore the shiny shirts and hats, but they can't half play. Kaleb chose to showcase some tracks from his upcoming album, an audacious choice, but 'Time Is An Illusion Baby' has Zep all over it, until an electric keyboard solo moves to a Latin pattern. And they closed with 'Messianic Indulgence', a banging Prog tune, just with Lounge touches. As you do. Plagued with a quiet guitar sound, Kaleb McKane had something undefinable and wonderful tonight. 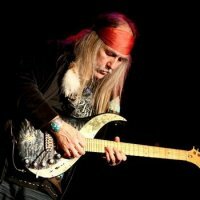 Uli Jon Roth is time served and much loved, on a Sunday night the smaller Academy 3 was a bit roomy, but people missed a treat. And I was sorry I couldn't stay for the whole two hours-plus, as his band and his sound were superb. The sound? Warm and full. The band? Cool, easily dispatching this intricate music and showing us harmonies to enfold and swaddle us. Roth isn't a showman, he has a gentle and calm delivery, explaining what he will favour us with. Among them was a soaring 'Electric Sun', a lovely sixties 'Why?' and 'Don't Tell The Wind', delivered with those gorgeous voices, in memory of his sadly recently deceased brother Zeno. Although a guitar supremo, he never overplayed, just taking us on a beautiful journey, even sweetly announcing before 'Hiroshima' that it was a little epic before showing enough histrionics to keep us constantly interested. And making us very happy with early Scorpions tracks, of course. There was an acoustic set and more electric wonders to come, but I sadly had to leave, to seek out Roth albums on the Monday. Didn't know much about him, certainly want to now.